A small tin and paper button badge made by The Whitehead & Hoad Co of Newark, New Jersey, USA, and used by the Vanity Fair cigarette brand as a giveaway with their product. Depicted on the badge is a portrait of the then Col. Robert Baden-Powell, as part of a series on Boer War leaders. 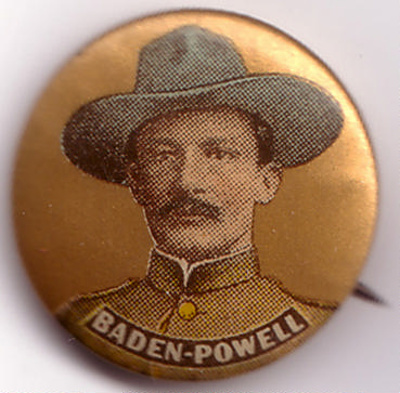 Baden-Powell was involved in the war as commander of the beseiged town of Mafeking which brought him into the public eye.